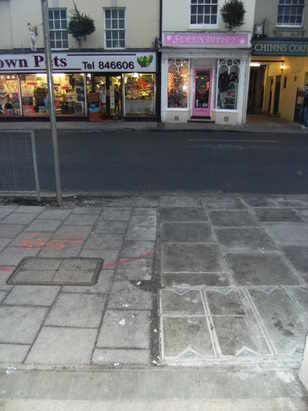 AS THE diggers and levellers return to haunt Warminster Market Place this week we present a new feature on visionforwarminster.co.uk – Pavement Watch. Pavement watch will monitor progress on the town centre improvement and repaving work which started way back in the summer of 2007. In the Warminster Journal, Wiltshire County Council’s Martin Rose is quoted as saying ‘laying slabbing and kerbing is historically very slow work’. “He isn’t kidding,” said Steve Dancey. “But at least now we have a timetable which states that the work should take eight weeks to complete. “We aim to take weekly photos to monitor the progress the team has made each week and we will publish details of how much progress has been made on this site. “Warminster has been poorly treated and this work has taken far too long. “More resources should have been committed but the powers that be are seemingly unconcerned about the death of our high streets. Our first photograph was taken on Sunday 4 January and shows that the new slabs had reached Serendipity and the entrance to the Three Horse Shoes Shopping Mall when work stopped before Christmas.